The inaugural fixture between these 2 clubs could not have gone better for the hosts. The 3 batting dynasties of Jon Webley, Jim Davies & Darren Tempany, who's performances would have far greater adversaries shuddering & today's unlucky opponents wondering if it is always like this. From a position of 70-1 after 20 overs they kicked on to such an extent that over 200 runs were scored in the final 20 & the total of 292-5 was the largest 40 over total. Alex from The Village " I thought it was an enjoyable game. You bated well as a team, in fact the differences between he two sides was based on which team had players who betted sensibly and left the ball or defended. Of ten overs the scores for both team were similare, the difference was that you guys kept wickets and accelerated wheareas we threw our wickets away. I look forward to seeing you at the Alebert Rd Rec." Matt Callender, Pete Hollman, James Gleadow, Steve Lay*, Darren Tempany, Jon Webley+, Ian Lay, Matt Patel, Sheldon Greenland, Jim Davies and Lucius Faisal. Fastest 50s:- Jim Davies in 30 balls was the 4th fastest & the new fastest ever is Darren Tempany's off 21 balls in 30 minutes beating 24 Jonathan Campbell	v	Bayshill	24.6.01. Village CC, from Hackney, stepped into the hole left by Chats Palace for this game at Wray Crescent. It was a beautiful sunny day which saw many a cricketer looking very burnt by the end of the day. The visitors won the toss and opted to field. Pacific started solidly as Pete Hollman and Jon Webley batted tidily against some useful swing bowling. Webley was targeting 250+ and consequently opened up and hit a couple of towering sixes to help him to 56 before lobbing a catch to mid-wicket off a long hop. 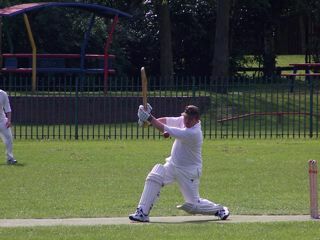 Webley equalled the record consecutive number of 25+ knocks. Hollman, 29, and Greenland fell soon after and with a long tail and the score at 130/4 off 27 overs the situation did not look too bright. However, Tempany and the returning Davies smashed the ball in true IPL fashion. Davies was powerful through the off side including a six over point that hit the authorâ€™s bike. Tempany caused many a call of â€˜headsâ€™ as he scored the fastest fifty in Pacific history and ended up on 92* off 42 balls. Together they added 142 in just over 10 overs. Pacific ended up on the third highest total in their history. A successful chase by Village CC was never likely but they made a brave effort and achieved a steady flow of boundaries including one six that hit a house halfway up. Greenland and then Faisal bowled very good spells from the playground end that deserved many more wickets than the two they got between them. Ian Lay bowled a full length and picked up 4-54 before becoming jug shy (understandable having got a parking ticket earlier in the day). Gleadow, 2-36, didnâ€™t bowl well but bowled Koder for a duck when the ball hit the pad, looped over the batsmanâ€™s shoulder and then spun on to the wicket. Callender got a rare bowl and deserved his wicket and was unlucky that Gleadow dropped two chances at deep midwicket. The game ended when Gupte had to retire with cramps.